Some states have designated state butterflies, some state insects, and some both. The European honeybee is an official state insect for seventeen states. A national symbol is an item that represents or symbolizes a country. It can be the flag, the seal of the country, a specific animal, plant, color, artifact or the national anthem. The national symbols of the United States include the Seal of the United States, the flag, and the national anthem. Each of 50 states of America has its official state symbols that represent the natural treasure, cultural heritage, and the people of the state. The adoption of state symbols began in 1893 when a "National Garland of Flowers was created for the World's Fair in Chicago. The garland consisted of flowers collected from each state. State symbols are not unique, and a state can have more than one symbol. 48 US states have designated state insects or state butterflies, with many states sharing the same insect or butterfly. 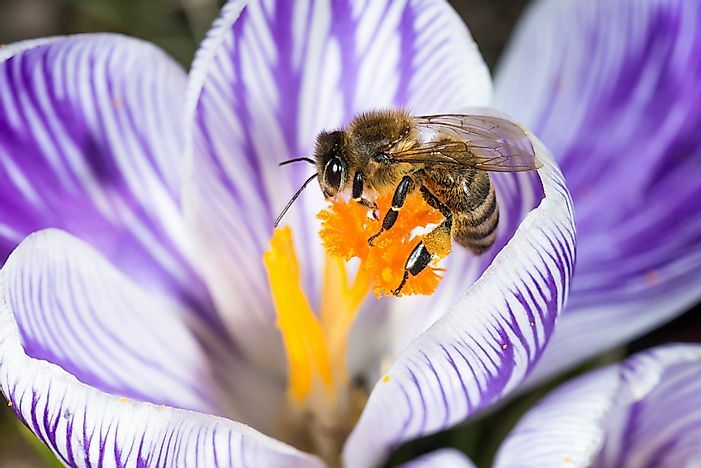 The European honeybee is an official state insect for seventeen states because the bee plays a crucial role in agriculture. Bee pollination is essential to the survival of the plants and consequently humans; they also produce honey and wax. In Utah for example, the bee was adopted after a 5th-grade class advocated for its adoption due to its small size but great importance in agriculture. The European honeybee live in colonies of 80,000 individuals led by a single queen. The colony also consist of a small number of males to fertilize the queen's eggs. A majority of the members are worker bees. The 7-Spotted Ladybug is a state symbol for the states of Delaware, Massachusetts, New Hampshire, Ohio, and Tennessee. Students chose the ladybug in all the five states because it is calm and beautiful. The ladybug help farmers control crop damage by other insects because it feeds on tiny insects and larvae. The 7-Spotted Ladybug is widely distributed across the five states. The Monarch Butterfly is an official state insect in the states of Alabama, Idaho, Illinois, Minnesota, Texas, Vermont, and West Virginia. Elementary school students in the seven states chose the butterfly because of its attractive appearance and gentleness. The butterfly symbolizes the friendliness of the states. They are found in shrubs and forest especially close to the milkweed plants which is their preferred source of food. The Eastern Tiger Swallowtail is the official state insects for the states of Delaware, Georgia, North Carolina, South Carolina, Virginia. This butterfly was designated in Alabama at the request of Selma City Council “The Butterfly Capital of Alabama." The other states considered the Eastern Tiger Swallowtail because it is found in abundance within the states. The state of Tennessee has a record four insects as official state insects. The common eastern firefly and the 7-spotted ladybug were designated in 1975, the European honeybee in 1990, and the Zebra swallowtail butterfly in 1995. The European honeybee is the official state agricultural insect while the Zebra swallowtail butterfly is the official state butterfly of Tennessee.